Kitchen is a small room meant for the purpose of cooking and food preparation. Most of the time the lady of the house remains in this small room cooking for her family. So, why not to make it, where the women spend most of the time, a place where she would love to work? The evolution of the kitchen is linked to the invention of the cooking range or stove and the development of water infrastructure capable of supplying water to private homes. Until the 18th century, food was cooked over an open fire. Technical advances in heating food in the 18th and 19th centuries changed the architecture of the kitchen. Before the advent of modern pipes, water was brought from an outdoor source such as wells, pumps or springs. Generally, a kitchen has a stove, a kitchen sink, a place to keep utensils and a place to keep the groceries. Unusually, it also has a place for refrigerator. Being belonging to a Punjabi family, kitchen is one of my favorite places. Rightly said that a the way to a man’s (or for that matter a women also) heart is well cooked, delicious food of his/her choice. 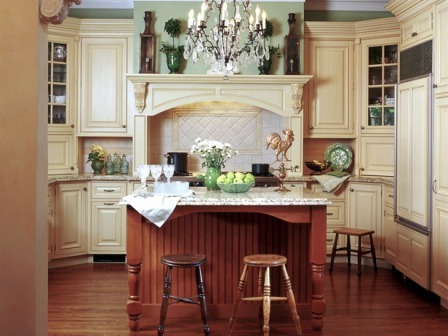 Traditional type of kitchen has that aesthetic appeal resembling to the past, or can be said derived from the past. The interior has the arches, the ancient contemporary materials being used for wall, floor and roof finishes. These kitchens look very beautiful, elegant and also impart the feel of traditionalism and culture. A small apartment with a small area can’t have an area for a large kitchen. So why not to utilize that small space efficiently and use every inch of the space with maximum intelligence and tactful planning. A small kitchen might include some cabinets, and a stove, a ventilator, and a sink. These are must requirements. Other than this, if space allows, add on to the place for a sitting or something related to keeping of fridge or a microwave, etc. This is the most common type of kitchen being used all over the world. Reason behind this is, one, it is easy to fit in any kind of planning, two, it is easy to plan in itself, three, whatever it may, it does not affect to the aesthetics of the house. A kitchen that lines up in a straight line against one wall is called a straight kitchen. This kitchen has everything that is required but is still beautiful besides it’s alignment. An island kitchen is a type of a kitchen that has an island means a place that is centrally located that might not be necessarily be the part of kitchen utensils or the slab. It can be used for storage, or for seating slab. 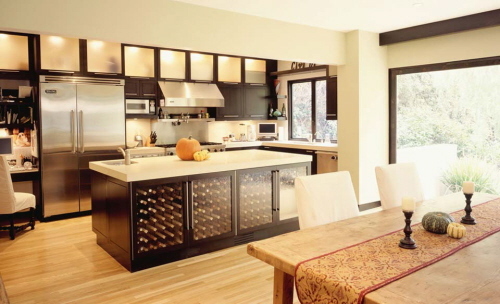 Modular kitchen is combination of standard and interconnected cabinets, hardware and accessories. Interconnection makes all of them function like a monolithic structure. Unlike standard and separate units, it is easy to manufacture, easy to transport, easy to install, easy to re-install and easy to maintain. It is designed for specific functions such as drawer unit, sink unit, gas cylinder unit, corner unit etc. Modular kitchen comes in various shapes, sizes and forms. 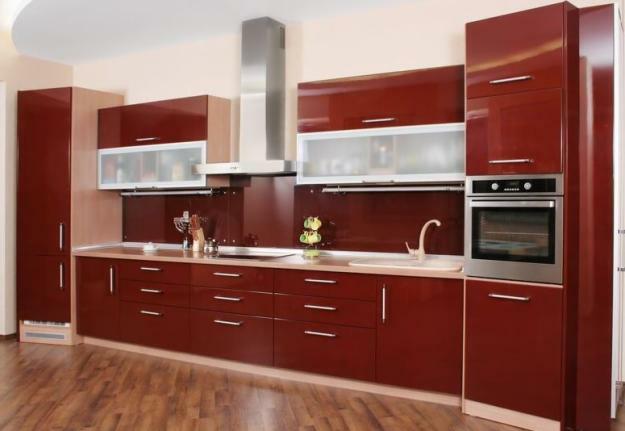 These prefabricated kitchens can be chosen according to the will of the person. L-shaped kitchens have slabs on the two sides of the kitchen walls. 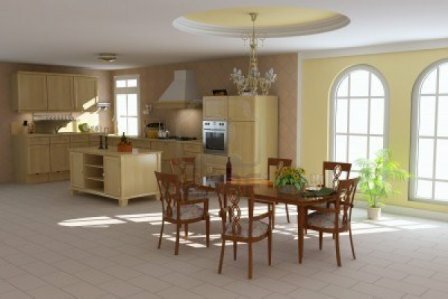 It is again a common type of kitchen design being used as is linear in its form and is easy to adjust in any kind of house or place irrespective of the shape of other building parts. 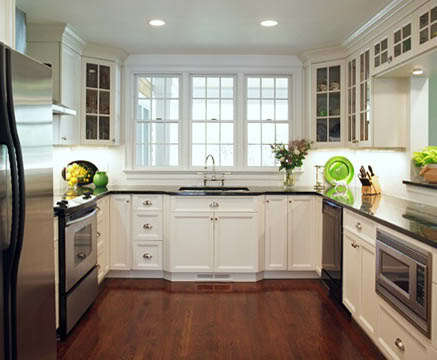 Large kitchens are quite common these days as the people have started realizing the importance of the kitchen place. These kitchens have a larger area and can be beautifully designed according to the requirements of the place and users. Materials available are many and can be chosen accordingly, as for the large kitchen restrictions of the materials minimize to a large extent. 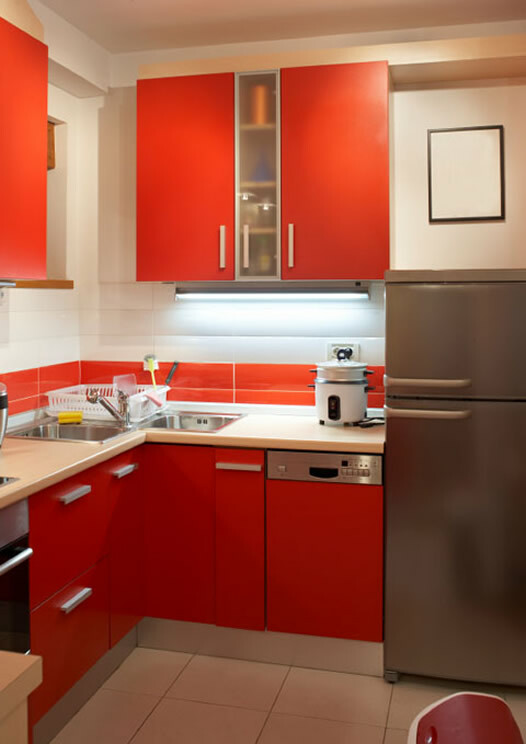 These types of kitchen can be seen in modern day planning. These types of kitchens are space friendly and occupy a lot less space having all the basic amenities fulfilled though. Kitchen combined with a dining area, i.e. a place where food can be eaten, is known as dining kitchen. People who love to eat freshly cooked food and or the people who love hot food, this type of kitchen is a preferable choice. The U-shaped kitchen layout is one of the basic kitchen layouts that decades of continuous hard work had lead to establishing of its existence. 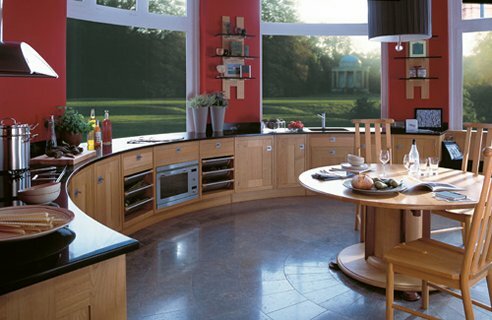 The U-shaped kitchen layout is a useful and versatile layout for a small, medium or large kitchen. A U-shaped kitchen consists of work space on three adjoining walls, two parallel walls perpendicular to a third. There are no traffic lanes flowing through the work area. 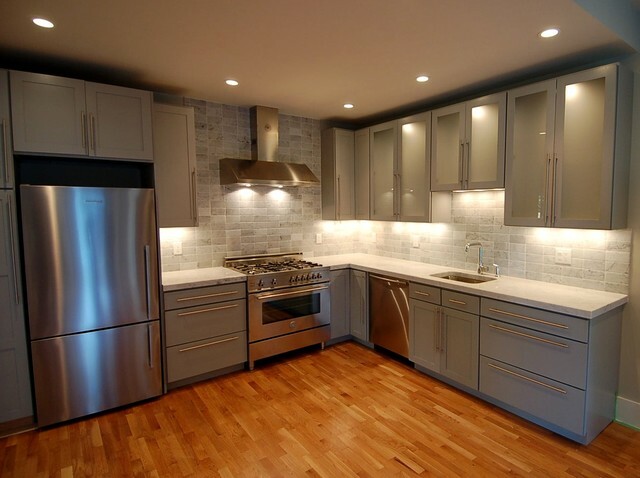 Kitchens are the most important part of a building, whether be residential or commercial. So, design it according keeping in mind that the user feels relaxed while working in there, rather feeling suffocated.